Hanauma Bay, located on the very southeast side of Honolulu, on the island of Oahu, Hawaii, is one of the most popular attractions to visit on the island. Everyday thousands of both tourist and locals from Hawaii show up at this beautiful natural bay, which is carved into a crater, and surrounded by green mountain walls. 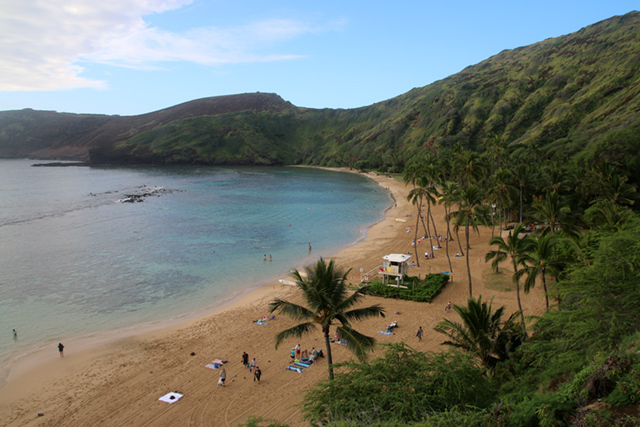 Hanauma Bay is more than just a beach, it's a nature preserve and a sea life sanctuary, known for its reef and abundance of marine life. You can come to do some swimming and relaxing on the beach, but the main reason most people visit is to enjoy the world-class snorkeling. 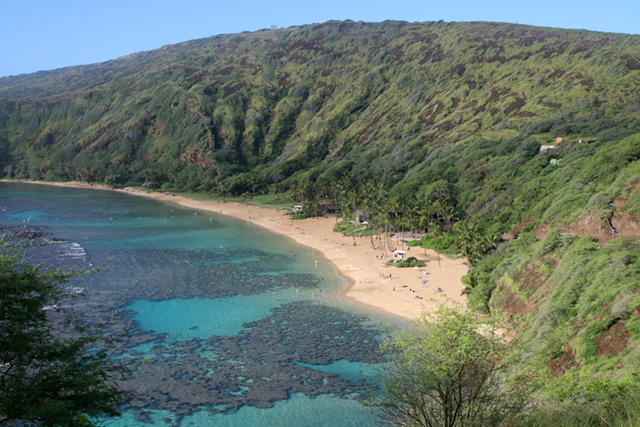 Hanauama Bay is a nature preserve, which is operated by the state – so it's a protected area – and that's great because it also means that the natural environment is regulated and maintained. 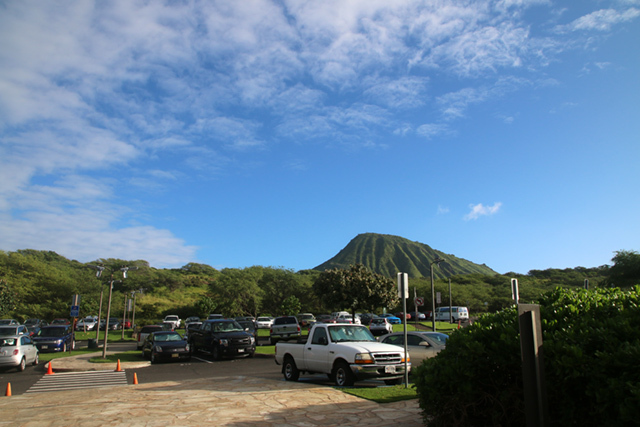 From the parking lot, you have a nice view of Koko Head Crater, another awesome place to visit, and also the nearby Makapu'u Lighthouse trail. The parking lot is at the top of the bay, so after parking, make sure you first get an overview look of the gorgeous bay below. From above, you can really see the incredible coral reef formations, and even spot some schools of fish in the crystal clear water below. 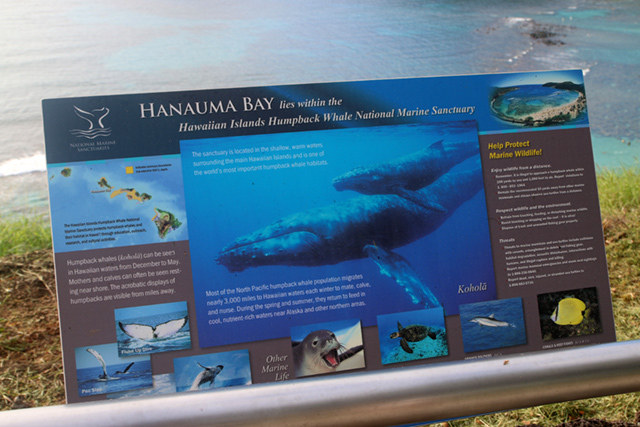 Also, if you visit in the right time of the year, and have a bit of luck, you might be able to spot a humpback whale in the distance (just outside of the bay, there are very deep blue waters, and it's a prime spot for whale watching). 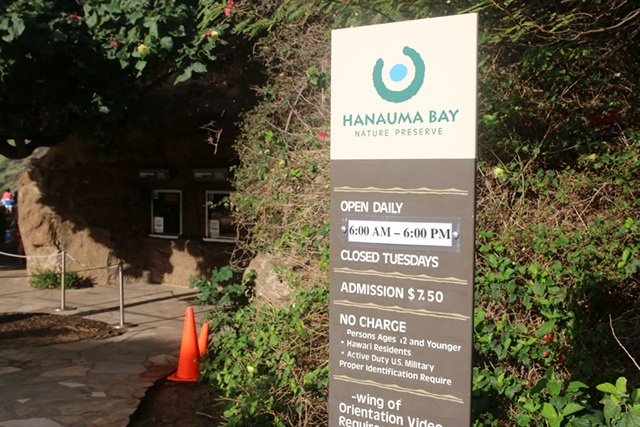 After paying the entrance fee, you are first required to go into the Marine Education Center and watch a short film about marine conservation, the do's and don'ts for taking care of the reef, and some brief information about Hanauma Bay itself. Though it might be a bit boring, and though you'll just want the film to be over so you can get to the cool water below, I think the film is a good way to make more people aware of how to preserve and take care of the reef and bay. From the top parking lot, it takes about five minutes to walk to the beach below. Alternatively, there's a small trolley, and for a small fee you can ride down or up if you need to. The beach itself is incredibly beautiful, brown coarse sand, green mountain walls, and calm lapping water that's clear and refreshing. It's best if you have your own mask and snorkel, but if you don't, you can rent a set along the beach. 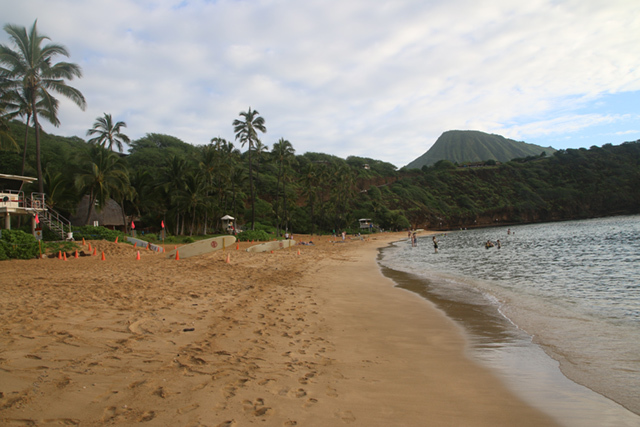 Here's a little side tip: Since Hanauma Bay is such a popular tourist destination, they charge a premium for entrance. $7.50 in my opinion is quite a steep price to pay to go to a beach, especially if you have a family. But luckily there is a way around the fee, you just have to wake up and enter the park anytime from 6 am – and before 7 am, and you can park your car for free and enter for free. On my latest visit to Hawaii, I arrived at 6:45 am and it worked perfectly. Plus I avoided the major busloads of crowds who all seem to show up around 10 am each day. I was just watching a video my brother in law made of their trip to Hawaii just like an hour ago and my favourite part was the footage from Hanauma Bay. It looks so beautiful and I love all the sealife you can see there. I would just love to go to Hawaii to see the sites. I just finished watching a DVD on the favorite tourist spots to Hawaii and Hanauma Bay was prominently mentioned. Thanks for posting the great pictures that you took. Hawaii has a lot to offer.